Within healthcare, the race is on to collect outcomes statistics that may reveal to patients, health insurance companies and employers which physicians and hospitals provide the best quality healthcare. Easier said than done. In the automotive industry the most recognized study of car quality is the JD Powers annual study that reveals customer satisfaction and customer-reported defects per 100 cars. It is important to note, that the JD Powers study on automotive quality does not take into consideration a car manufacturer’s report on how MANY cars they sold, or repair bills. Instead, it is a study of how customers rate their car, if they would buy another one of the same make and model, and how many problems they had while owning the car. So at least in the automotive industry, the defining measure of quality is the consumer’s satisfaction with the product, rather than an outside assessment of repair bills. Conversely, there are some complex issues when measuring the quality of healthcare. For one, unlike car manufacturing where the car builder starts with a blank slate of metal and new parts that are then assembled, that is NOT the case with healthcare. People show up to the doctor in wildly different condition. One 65 year old patient with a herniated disc may show up to the surgeon’s office in perfect body weight for their height, who previously ran half marathons, who doesn’t smoke and has no lung or high blood pressure issues. Conversely, a second 65 year old patient may be obese, on high blood pressure medication, a smoker, and unable to climb a flight of stairs without getting winded. Who gets blamed for a less optimal result from surgery performed on obese patient #2? Certainly, the surgeon who only operates on the first type of patient, and simple cases in general, will have a better outcome as measured by an outside entity. The physician who takes on the complex case that the other physician wouldn’t accept, will get punished with a poor scorecard. USA Today reported on July 12, 2015 a Pro Publica study that was used to create “surgeon scorecards” for various elective surgeries. This is a admirable move forward to collect and report data for patients, health insurance companies and employers. The scorecard taps Medicare data collected by the government from previous years to distill a surgeon scorecard that takes into account deaths while in a hospital, complications and readmissions to the hospital within 30 days. Much of the data that is being reported from the Medicare archive is typically older than one year. The problem with ANY embryonic reporting system, however, is that it may not fully take into account “Patient Severity at Intake,” that is, the condition of the patient at the start of treatment. Also, as one physician critic noted, does a person get readmitted to the hospital because they fall after the surgery; or because they didn’t take their prescribed anti-coagulation medications correctly; or because the surgeon missed a fracture on an X-ray? The most difficult issue with the existing Medicare hospital data, is patient severity at intake. Said another way, what condition are they in when they walk through the door as a new patient? For example, the Pro Publica scorecards only take into account Medicare data, which by definition are those people over 65, rather than younger, healthier patients. Because Medicare is the only payor that requires hospitals to collect and report data, most healthcare outcome studies today are limited to assessing the quality of healthcare provided to patients 65 years old and older. As a regional referral for back and neck pain, the University Orthopedics Spine Center receives a far more complex patient base than other clinics. One in four new patients walking in the front door of The Center for Spine Health have had previous back surgery elsewhere. Half of patients have red flag symptoms like radicular pain and numbness into a leg or arm, which implies disc-related problems, rather than simple acute back or neck strain. 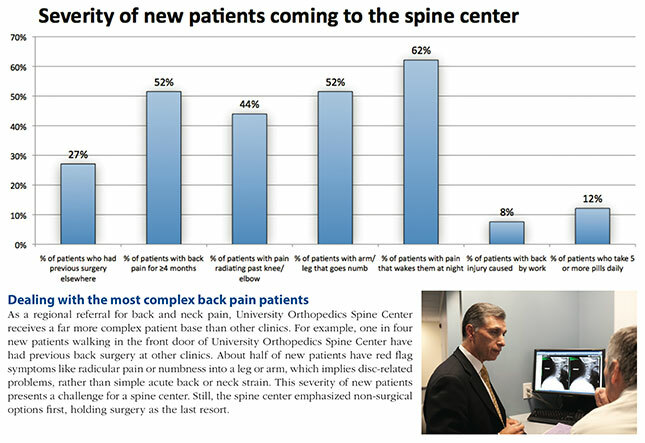 Another 52% of The Center for Spine Health’s patients had back pain for 4 months or more. This severity of new patients presents a challenge for a spine center. How does this severity compare to other physicians? Compared to a small practice of a surgeon in solo practice who does a variety of orthopedic surgeries, a regional spine center is likely to be referred more complex patients from a wider geographic area simply because they specialize 100% in spine. This can create a conundrum for the spine surgeon when confronted with a Medicare patient who is 70 years old, obese, a failed back surgery patient from another surgeon six months earlier, yet still in extreme pain and begging for relief. The surgeon who is concerned about his reputation on a surgeon scorecard may “pass” on this patient even though there is no other specialist willing to accept the patient. Other physicians recognize the issues noted above and still accept Medicare patients because they believe it is their community responsibility and they believe they should do their best to help patients who are suffering from back and neck problems. These same patients ask these physicians for help to a return to an active life, and these physicians do their best to provide their medical expertise in that regard. 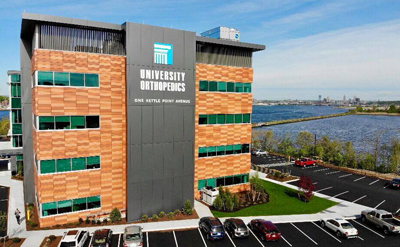 The fact that the Internet presence at UniversityOrthopedics.com is perhaps the most educational source for information on back pain in the State of Rhode Island demonstrates the commitment of the University Orthopedics Spine Center to provide helpful information to those with back or neck problems. We have invested heavily to provide the most educational content on the subject of back pain, neck pain, nonsurgical treatment options for spine and the most advanced surgical treatment options. We print and mail out for free more than 1,000 Home Remedy Books for back pain and neck pain each year — as a community service. We believe the best healthcare comes from a well informed healthcare consumer. We also are extremely attentive to patient satisfaction. 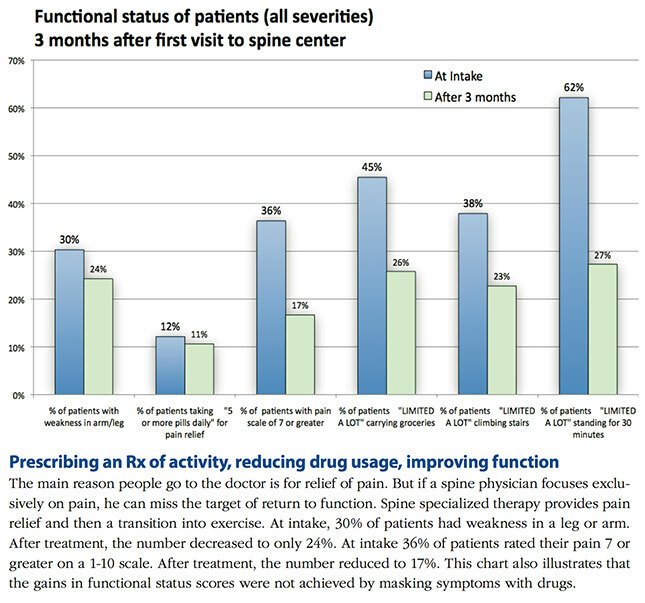 In an outcome study conducted in 2014 on our patients by an outside entity that had an RN call a random sample of patients, 92% of University Orthopedics Spine Center patients said they were very or somewhat satisfied with the time spent by the physician and 91% said they would recommend the clinic to a friend. As to clinical outcomes, patients reported improvement in pain relief, weakness in an arm or leg, functional status scores, while at the same time, reduced their dependence on pain medications. 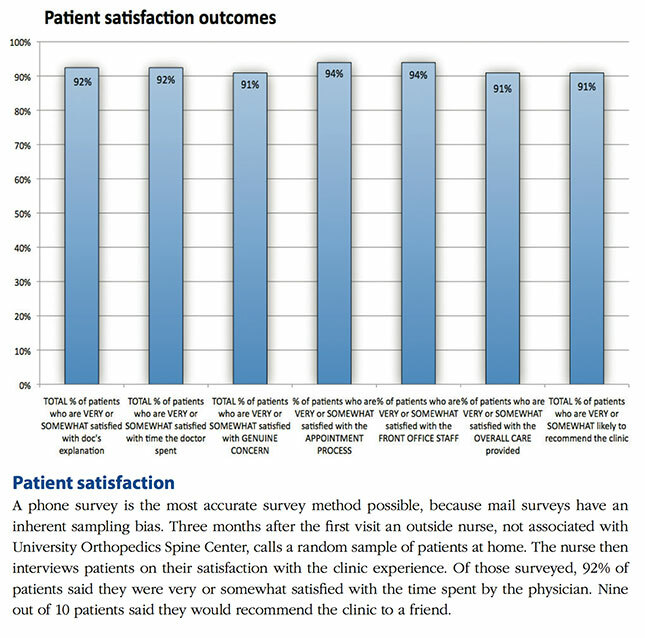 Consumers need more information to understand more about how to understand the evolving clinical outcome data that is published by outside sources, because in some cases the physician who provides lower quality care may be mistakenly celebrated as the champion, while the physician who provides higher quality care for complex cases is at risk of scoring lower by virtue of the cases they accept.